There's no real theme running through my current favourites, but there's definitely more of a Spring/Summer vibe appearing, finally! Even though the weather isn't playing ball just yet, my makeup and fragrance choices are starting to transition. Patience really isn't my thing. I may still be reaching for lots of layers in my wardrobe, but my face is breathing a sigh of relief as everything is being pared back and toned down. 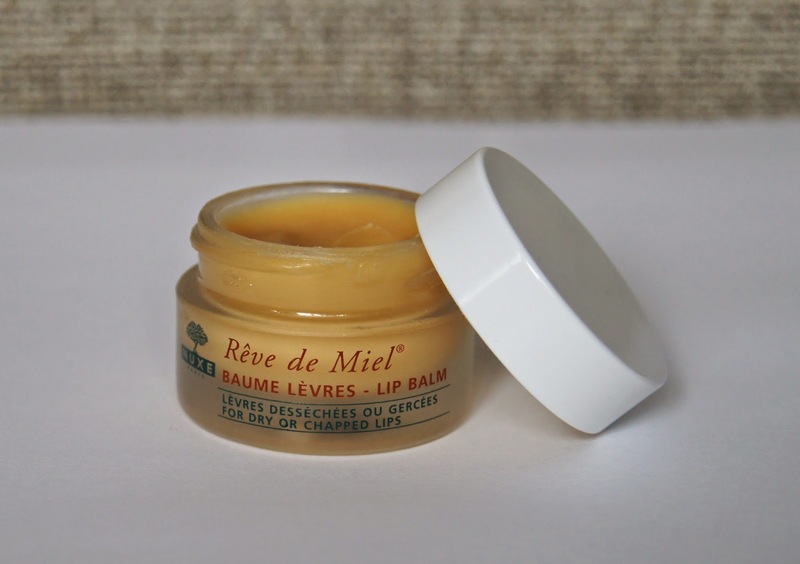 Hailed as the most effective lip balm out there, by many beauty bloggers, I'm clearly late to the party with my love for the Nuxe Reve De Miel Lip Balm. Smelling and tasting of honey and orange, this is a treat for the senses and not just the skin. Compared to most other lip balms, this one has a totally different texture. Instead of being very slippery and glossy, this balm is super thick and has more of a matte finish to it. Even the quickest slick of product coats lips sufficiently. Once applied, this long-lasting balm clings to the lips and withstands eating, drinking and even licking, without the need to rummage in your bag and apply some more. Rather than just adding a superficial, protective layer over the lips to prevent further dryness, a la Vaseline, this balm truly repairs and heals. Even when my lips have become roughly chapped and sore thanks to a battering from the cold wind, this balm has completely sorted them out in just a day or two. Normally, I'm completely put off lip products that come in a tiny, little tin or pot as they're such a pain to use and usually keep them at my bedside for the mornings and evenings. You can get a stick form of this lip balm, but I stupidly didn't notice this or pick it up at the time. As dipping your finger into the balm isn't particularly hygienic, it's not as quick and you're left with a residue on your finger and possibly only your jeans to wipe it off on, I'll definitely be trying the stick form ASAP. But, I have been carrying the little pot with me, up until now and I've let the formula of the Nuxe lip saver win me over, despite the packaging. £9.50 is more than an average, lip balm costs, but I'd guess that you'd need to repurchase about three sticks of another, cheaper balm, for every one pot of Nuxe Reve De Miel. 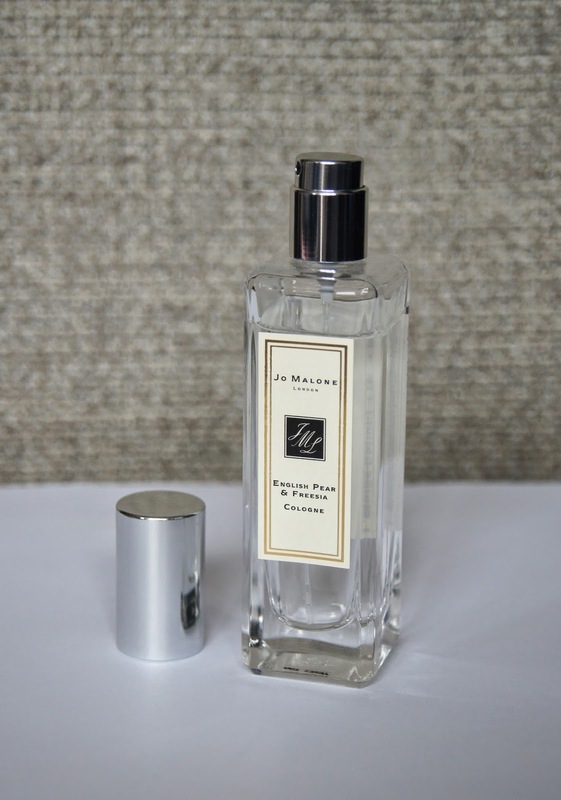 I mentioned in my last current favourites post, my adoration for the Jo Malone Assam and Grapefruit Cologne. When I purchased that, I also bought my beautiful Mum the English Pear & Freesia scent. After weeks of sniffing her and falling in love each time, I couldn't bear it any longer and had to go and get a bottle all of my own. Don't think I've turned my back on my previous purchase. No, I'm just greedy and having just finished off a couple of other fragrances recently, I could justify my decision. Rather than being the perfect Autumn scent as Jo Malone suggest, I find that English Pear & Freesia is the epitome of Spring. Light, fresh and sweet, it screams sunny days, blue skies and happiness. It's one of those scents that instantly boosts your mood and transports you off to a place of contentment and calm. Top notes of juicy pear surround classic freesia and patchouli elements, preventing this fruity, but floral, cologne from smelling too stereotypically, old-lady-esque. Once it has had time to dry down, it becomes deeper, with hints of amber coming though and adding a sensual twist. Being so refreshing and clean, I expected the scent to last a couple of hours at most, but I was surprised to find it lingered for the entire day on the skin, or for a week when spritzed onto any items of clothing. This is a truly delightful, sophisticated fragrance that I feel would be hard for anyone to turn their nose up at. Of course, the price tag of £39 for 30ml, or £78 for 100ml is no surprise. Classic, simplistic and chic, the bottles are so elegant and make the perfect gift. Even if it is a treat from yourself, to yourself. That's allowed! I picked up Benefit The Porefessional Agent Zero Shine PRO Powder when it was first released, but after a sudden influx of PR sample reviews, I held off on giving you my own ode to it. Personally, I always like to read reviews after some time has passed, to make sure the product is truly worthy of the suspicious surge of glowing, flawless reports. So, I've had a good while to test it out. 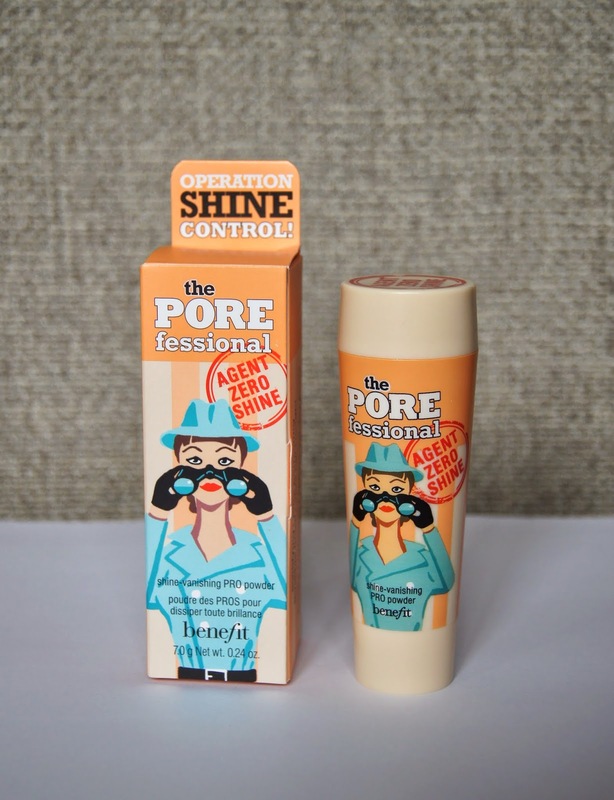 Being the sister product to the much-loved Porefessional primer (which I have a love/hate relationship with), I was intrigued to see how this new release would match up. As you'd expect from any powder, this product instantly eliminates any shine that you have. As Benefit claim, there isn't an obvious, heavy-looking, powdery residue being left behind. The finely-milled powder does act like a magic, mattifying veil, if used lightly. I have some larger pores in the areas next to my nose and this powder does make them disappear, but the key to keeping it looking natural, is to use as little as possible. Whereas other powders are successful at masking pores initially, the effect doesn't always last, but this one has them hidden up until I remove my makeup. As natural oils start to come through during the day, my pores aren't exaggerated and remain undetectable and my makeup refuses to slip and slide, even if I skip primer. My only gripe with the formula of this Benefit baby, is that it isn't completely translucent. If I dust over my entire face with it, my complexion becomes quite yellow and slightly darker. Fortunately, I only concentrate powder across my T-zone and avoid the outer edges of my face, so I can get away with it. But, if you're super pale or have very pink undertones to your skin, then you may want to swatch the powder before purchasing. However, the yellow tinge to it is great if you want to tone down any redness in your skin. As you may expect from a quirky brand like Benefit, rather than coming in a standard tub like most loose powders, this one is suspended in a double-ended tube. One end has a tiny, built-in brush and the other has a removable pot that you decant the powder into, before sweeping it across your face. This may be a good solution for applying a loose powder on the go, but I'd stick to using my regular brushes to apply the powder at home. Whilst the small brush is soft, it's densely-packed and I find that it picks up too much powder, which can spoil the application and waste product. 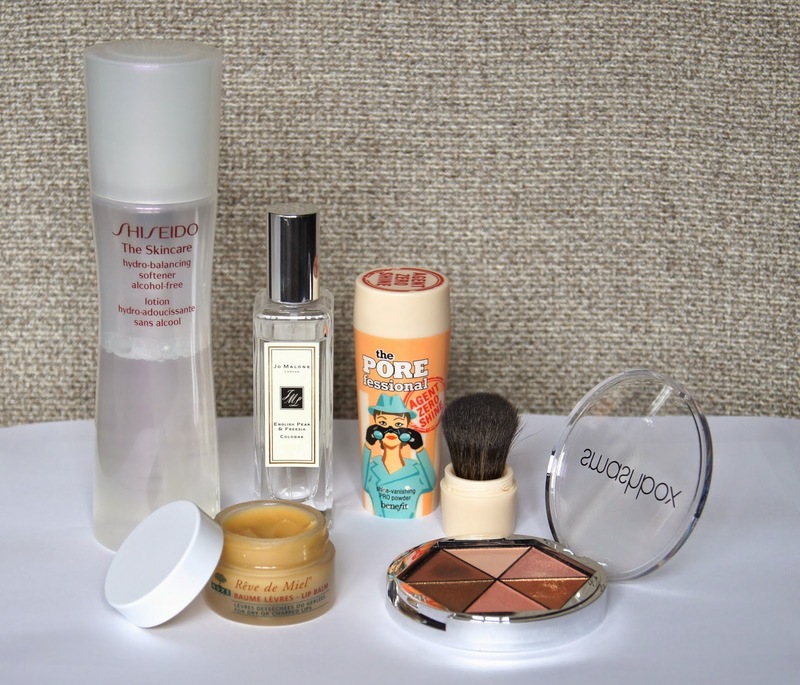 The gimmicky packaging is still a faff to use when you're out and about, but I mainly use powder in the morning when I first set my base in place and need minimal top ups now that my face resembles the Sahara Desert. At £23.50 for a measly 7g of powder, I think Benefit have been rather cheeky with their pricing. But, the powder does what it claims to, in my eyes, and I have been loving the results it gives. Whatever you do, DO NOT CALL THIS A TONER. When I bought this at a counter and uttered the dreaded word, the lady practically shouted at me and I felt like a naughty child, back at school. No, this is Shiseido The Hydro-Balancing Softener. Now, I've harped on enough about how my skin has done a 180º, from an oil slick to a concrete slab in a matter of months, so I won't go on about it anymore. But, since this has happened, I've had to alter my skincare routine. One change is that I decided to cut-back on my use of toners and change the type of toners I used, too. I still have a supply of my old favourites stocked up, but I'm now only really using a couple aimed at hydration and softening. Nothing harsh. 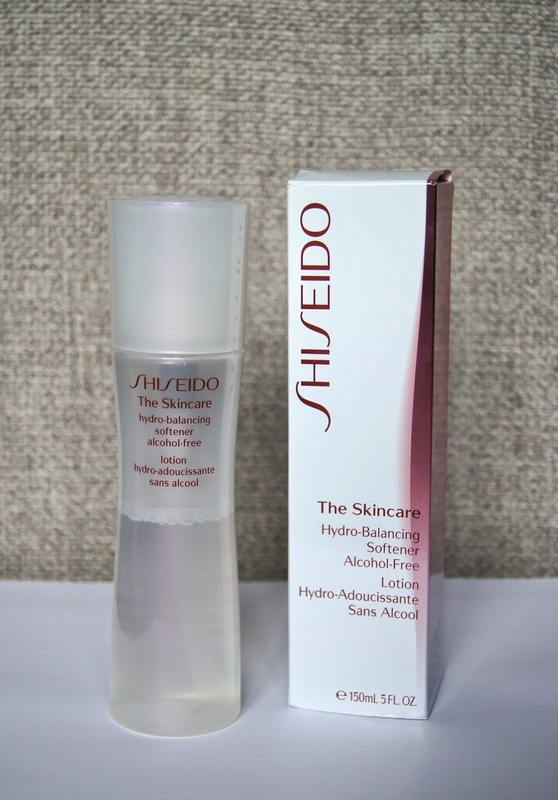 My favourite of the moment is definitely this one from Shisheido's 'The Skincare' line and is my first foray into the Japanese brand. On first use, this toner softener doesn't feel all that special and has a water-like consistency. But, afterwards, you can really notice a difference. Fresh, light and cooling, it's such a pleasure to use. 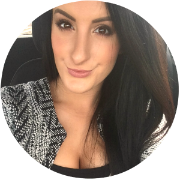 Alcohol-free, it never stings or feels uncomfortable, even when my skin is feeling sensitive. There's a veil of moisture left behind on the skin, which feels silky and so soft, just as the name of it would suggest. My drier skin is comforted and never feels tight after I use this softener. I love the fact that it doesn't fully absorb into the skin and when I layer my serums and moisturisers over the top, my skin feels so much more hydrated and a lot softer. It hasn't suddenly turned my drier skin around, but it has definitely helped me to get that desirable, dewy sheen back, after my skin has been a bit dull. I actually picked this up whilst I was in NYC and it doesn't seem to be sold in the UK. But, it is available online from Sephora, which now ships internationally. The 150ml bottle was $36, which currently converts to roughly £22. This toner has a pump on it which makes application totally faff-free and uses so little product that I can't see myself finishing this bottle up, anytime soon. 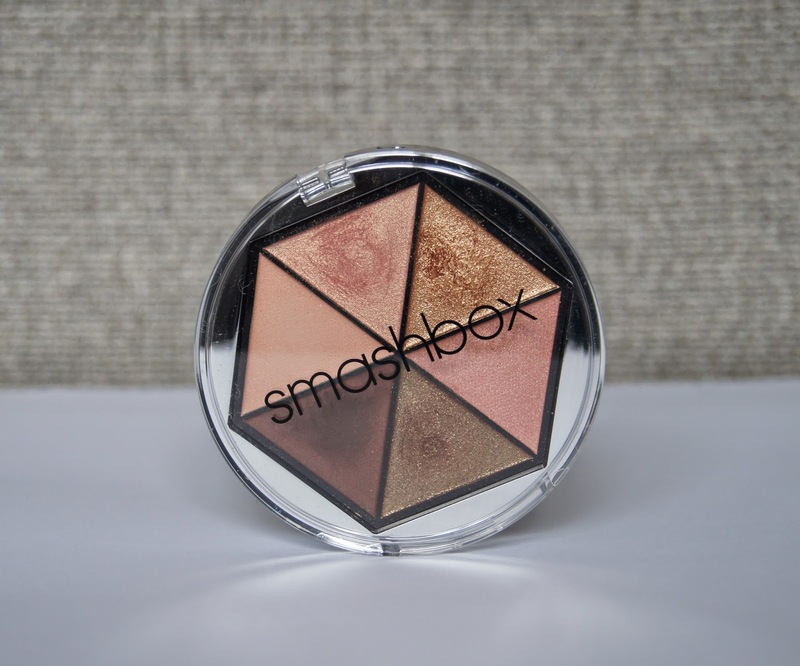 This eyeshadow palette is part of the limited-edition, Wonder Vision Eye Set in Sparks, which I picked up from Smashbox's Christmas collection last year. The three different sets are still available now, although I'm not sure how long for. The set also includes a mascara and black eyeliner, but I haven't tried either of the other products yet, as I have enough mascaras open at the moment and I rarely wear black eyeliner. But, I've been reaching for this nifty, versatile eyeshadow palette almost every day, for about two months. 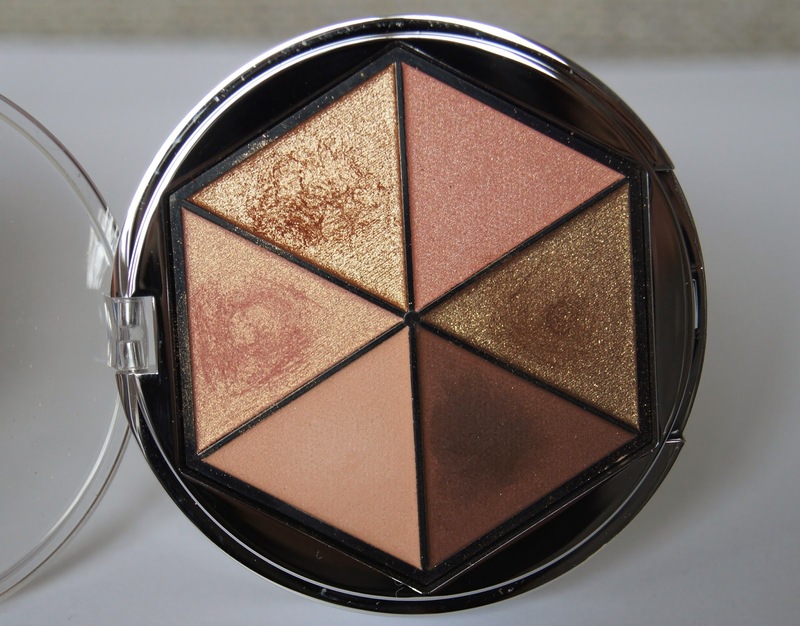 Containing six, pink, golden and brown tones, this has the perfect shades for Spring/Summer. There's four shimmery shades in there, along with two mattes, which will have you covered for creating a complete eye look, whatever makeup mood you're in. Reminiscent of the Urban Decay Naked 3 palette, this has some rose-gold tones to it, which just look stunning and are bang on trend. 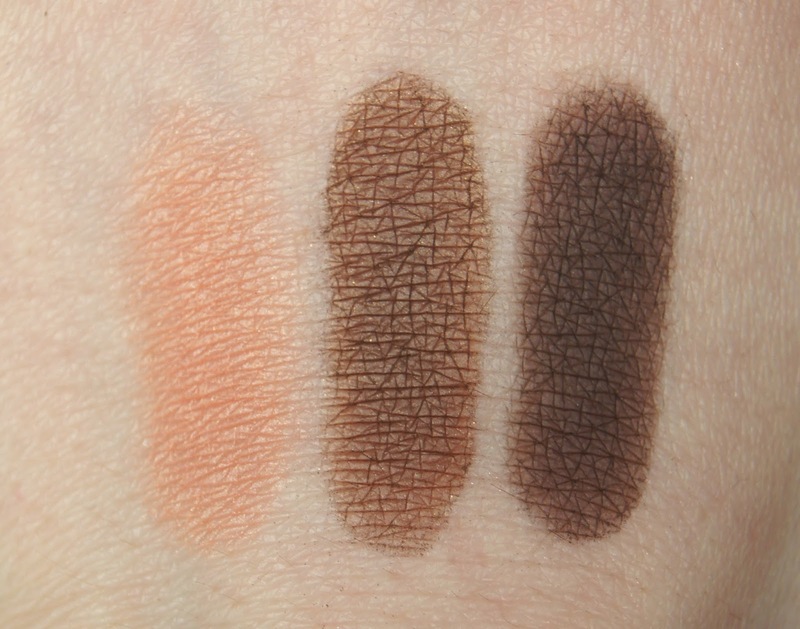 The quality of the shadows isn't quite as impressive as Nars or MAC, but the formula is definitely high-end and they blend well. 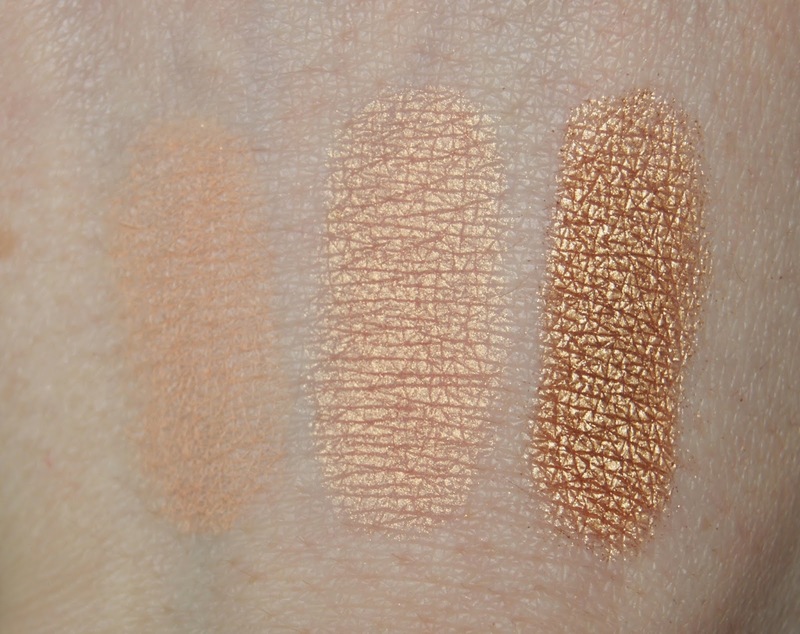 Pigmentation is good with all of the shades and the matte colours are too powdery or chalky. There's barely any fall-down when using the shadows and if you layer them on top of a primer, the colours stay strong throughout the day. You can use the shadows wet to achieve a higher intensity, but I haven't tried that. Bare is a completely matte, peachy shade which creates the perfect canvas for bolder looks, or just evens everything out if you want to keep your eye look simple. Peach is a soft, peachy-pink (who would've guessed?! ), infused with heaps of finely-milled, golden shimmer. Gold is a metallic, vivid, bronzed shade that can give eyes a wet-look when you pack it on heavily. Coral looks like a deeper, rosy, pink shade in the pan, but seems a lot more peachy once on the skin. This shade has more of a pearlescent sheen to it, as opposed to a shimmer. Bronze is a dark, warm, brown shade, packed full of golden glitter. Cocoa is a dark, rich, chocolate shade, which is entirely matte and is ideal for adding definition in the crease or using along the lash-line, instead of a traditional eyeliner. The slim, compact palette slips into even the smallest, makeup bag and has you covered for both daytime and evening looks, making it ideal when travelling. The eye kit was £35, which I think is amazing value, considering the mascara alone is worth £18 and the eyeliner usually costs £14. That makes the eyeshadow palette just £3. Say whaaattt?! Plus, if you aren't too confident with applying eye makeup and struggle with knowing what goes where, the kit comes with some step-by-step cards, to help you achieve different looks.